Now also available in Spanish and traditional Chinese, AzonMobile introduces new Mobile Web Builder to help users easily come up with an HTML5 mobile Web site that would display perfectly on any mobile device. AzonMobile continues to dominate mobile marketing tools and services with its integrated platform: Custom QR Code Generator, QR Code Tracking and now an improved Mobile Web Builder. The new mobile web builder has a trial version. With a quick registration, users can experience this drag-and-drop mobile Web site creator and have their own AzonMobile hosted mobile Web site. Further, AzonMobile unveils the traditional Chinese and Spanish versions of its platform. "We hope that making our site easily accessible to traditional Chinese- and Spanish-speaking people would help them get to use the tools we have in a language that they understand," AzonMobile CEO Patsy O'Connor says. AzonMobile is the same company that currently brings a unified mobile platform that allows users to create a customized QR code and track them. Now with the Mobile Web Builder, users can fully have an integrated solution for their mobile marketing needs. AzonMobile’s Custom QR Code Generator allows users to generate QR codes that are not like those boring black and white QR codes. Users can change the QR code’s colors, use a different body shape and even incorporate own logo into the customized QR code simply and easily! The company is behind the QR code campaigns of some of the world's biggest brands, including Sony Music, L'Oreal, and Veuve Clicquot. Azonmobile's unified mobile platform also allows users to track their QR codes, helping users gain insights into their QR code campaigns. O'Connor explains that with the new Mobile Web Builder, AzonMobile is now offering a full range of mobile services through their full mobile platform. 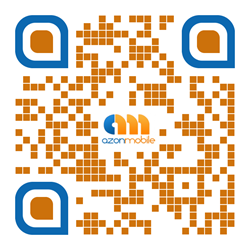 "Now you can go to AzonMobile to create your own mobile site, then create a QR code to direct people to your site and measure the effectiveness of your QR code campaigns via our tracking system. And this is only just one of the many possibilities that you can do with our full mobile platform!" O'Connor relates. The Mobile Web Builder allows users to create beautiful and functional mobile sites fast and easy! Users do not need to learn any programming language to create an eye-catching mobile Web site within minutes! The tool is easy to use even for beginners and non-technical people. The tool allows users to choose from dozens of thematic templates, such as templates for restaurants, events and professional services. These templates are easily customizable. Customers could also choose a blank page and start from there! "I think it is time that people and businesses have their own mobile Web site and we give you the tools to build it," O'Connor adds. Further, it can give users truly mobile-optimized Web pages. "You could be on an iPhone, a Blackberry smartphone, an Android tablet, or your desktop computer, and your site would look perfect," Vesko Kenashkov, AzonMobile's Chief Technology Officer, says. Headquartered in Sofia, Bulgaria, and with partners and representatives in the United Kingdom and Brazil, AzonMobile is a premier mobile solutions company that helps companies come up with successful self-managed mobile campaigns. With focus on helping customers build a useful mobile Web site and conducting successful QR code campaigns, AzonMobile has helped some of the biggest companies in the world come up with a mobile marketing campaign.